Ventura Golf's LoyalTee Rewards Program - a way to EARN FREE GOLF FAST! 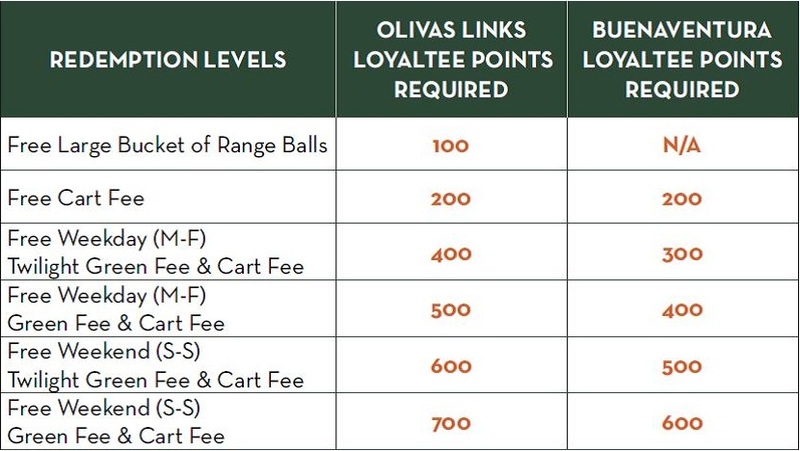 The LoyalTee Program is free to join, simply register here or visit the golf shop at Buenaventura or Olivas Links and register on the designated LoyalTee Station. NOTE: If you were a member of our former Golf Rewards program and you have not yet signed up for LoyalTee, please do so. Your Golf Rewards points balance will then be rolled over to your LoyalTee account within 30 days of registering. tracked electronically under your phone number - you don't need to keep track of a card. points are combined from purchases at Olivas Links & Buenaventura and can redeemed for free golf at either course. points are earned per dollar spent, $1=1 point. points can be redeemed for green fees, cart fees, & range balls. you can check your balance & see your transaction history any time on our websites & whenever visiting the golf shops. Watch your points add up fast! Q: What if I am already a loyalty card member in Ventura? A: The LoyalTee Program is a new program. We are no longer using the former Golf Rewards program. Please sign up for LoyalTee and upon doing so, your former Golf Rewards points will be rolled over to your LoyalTee account within 30 days. Q: Can I sign up online or do I have to come into the Golf Shop? A: You can sign up online at your convenience by visiting our online LoyalTee Station. Or you can sign up on the designated LoyalTee Station in either Golf Shop. Q: Can I get points if I pay for my friend’s golf round? A: No, LoyalTee accounts are per individual and points are non-transferable. But your friend can also sign up to receive points as well for free. Q: How many rounds do I need to play before I earn a free round? A: Points are earned per dollar spent in the Golf Shop. Please refer to the redemption chart above for details on the number of points needed for a free round of golf. Q: When I earn a free round are there restrictions on when I can redeem my free round? A: LoyalTee points cannot be redeemed for tournament play or on holidays.